It took my friend and business partner Steven Pressfield thirty years before he published his first novel. If he had to boil the thick slurry of reasons why it took so long, he’d tell you that it took that long to figure out how to write a single foolscap page. Years ago Steve was a struggling writer in New York, with a slew of unfinished manuscripts in his closet. He had no clue about why he knew deep in his heart that all of his efforts just didn’t have “it” to convince a publishing house to give him a shot. He just knew there was something wrong with his novels, but didn’t know what. So after Steve orders his cheeseburger and fries and gets his tall glass of ice tea, Stahl lays it on him. He reaches into his briefcase and pulls out a legal sized yellow pad, known in the paper trade as foolscap. “Steve, the good Lord wisely made one sheet of foolscap paper just long enough to outline an entire novel. The reason why your work is letting you down is that you may have a clear destination in mind when you start, but you have no map. How will you know if you made the best choices for getting to ‘THE END’ if you don’t have a game plan before you set out? THIS IS YOUR MAP!” he pointed to the yellow lined paper. Steve’s friend wasn’t just some civilian with no experience creating narrative Story. Norm Stahl is a highly respected and incredibly nimble and productive filmmaker with over 300 feature length documentaries to his credit. And if you have no sense of Story making a documentary you are in deep trouble. Over the years, Stahl had learned not to be so precious with his material, but to be brutal and decisive about what he wanted to say and how he wanted to say it. Stahl then pulls out a thick felted sharpie and draws two lines across the page, cutting the one sheet into thirds. The concept was so easy to get and understand that he had a hard time believing it was this simple. Like anyone else would, Steve resisted the notion. Eventually, in one of those All is lost moments we all reach when we’re forced to change, Steve did try it. He decided to map out a novel that had been scratching inside his head for years. He just had no idea how to execute. He only had a notion. That novel turned out to be his first published work. More about it in the next post. The reason why I bring up Norm Stahl’s Foolscap Method is that it is remarkably similar to what took me a good twenty years to figure out myself as a struggling book editor. I have a similar, but a bit more obsessive method, that involves an extra black line that divides the foolscap into four sections instead of three. It evolved as an editor’s diagnostic tool rather than a “create from whole cloth” Story creator’s point of view. But it’s absolutely a similar concept. In honor of my friend Steven Pressfield and his mentor Norm Stahl, I call it The Foolscap Global Story Grid. And in the next series of posts, I’ll lay out what it’s all about and how you can create your own. For fun, I’ve posted a generic version of it in the Resources section. “…then all you have to do is fill in the rest” is where I got bogged down, and it’s taken a lot of wandering and circling back to find my way out of those woods. I’m looking forward to your take on the Foolscap. Happy Thanksgiving to you and yours! 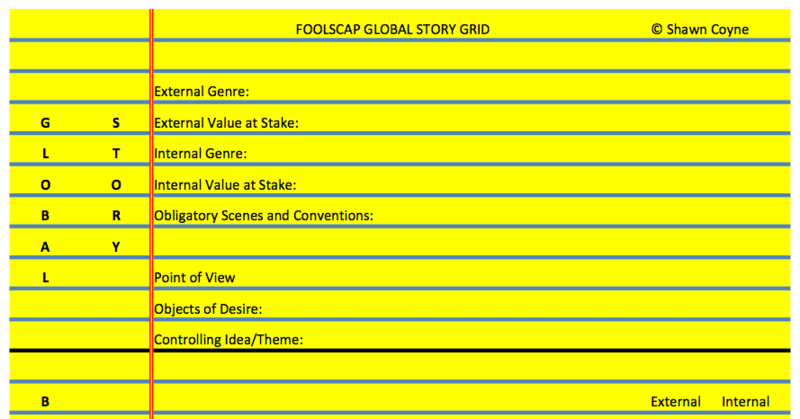 Check out the PDF at the bottom of the Resources section…THE FOOLSCAP GLOBAL STORY GRID. You’ll see a whole slew of things listed there from top to bottom that I will walk you through over the next few weeks. There are very specific decisions that you’ll have to make which will completely demystify “…then all you have to do is fill in the rest.” Hang in there. Gosh, so simple but effective. I just wrote out my global inciting incident and the global climax, and clarity that came is amazing. Looking forward to the upcoming posts Shawn! Works for everything. Business plans, short stories, novels, elevator pitches. I’m a fan. Thanks Shawn… I sure will be looking for the resources section… although I’ll take a shot at the three-part foolscap too! Thank you for the resource! I am going to use this as I plan my next few children’s manuscripts. Already self-published one. Working on another. I am glad that Kevin T Johns had you on his podcast! Do you talk about external and internal charge anywhere? That’s a concept I’d like to hear more about. Thanks! Charges are HUGE! I will cover them. I promise. The Foolscap Global Story Grid is one piece in the two piece puzzle (The other is the Story Grid Spreadsheet that covers the micro work) that will allow you to create a Story Grid for your work. Hang in there. I’ve just scratched the surface. I wonder how I will do it with ten main characteres ! And the truth is this, I do not know very well what are the scenes in a book. Hang in there. I will cover what a scene is in a future post. Valuable information and it could not have come at a better time. Thanks! In terms of web design, I think it’s a mistake to put the call to action “learn to tell a story at works” at the top of the page, without relating it to the context of the page. My first read as a regular web user is that I’ve arrived at a page where I won’t actually get anything of value without taking that action. Furthermore since I had already signed up, I was further confused, wondering where in that video course was the content I sought (re foolscap). Same applies to the Five Leaf Clover page, IMO. Just a thought, feel free to delete.